The US has affirmed its alliance with the Philippines after Defense Secretary Delfin Lorenzana announced a review the 1951 Mutual Defense Treaty. Lorenzana said he has directed lawyers from his department to review the Philippines’ Mutual Defense Treaty (MDT) between the two countries, with the objective to “maintain it, strengthen it or scrap it”. On Friday, December 28, Lorenzana confirmed that there was a move to review the MDT, but clarified that this was not a formal action by the Philippines. The treaty between the Philippines and the US commits both countries to defend each other in the event of an armed attack. Asked what was the objective of reviewing the nearly 70-year-old treaty, Lorenzana said it was to determine if the country should “maintain it, strengthen it or scrap it”. However, the military chief emphasised that the Philippines had benefited from the treaty, citing the Visiting Forces Agreement, the Enhanced Defense Cooperation Agreement and the former US military bases in Subic and Clark. “They are part of the deal. There are benefits we get from this MDT,” he said. 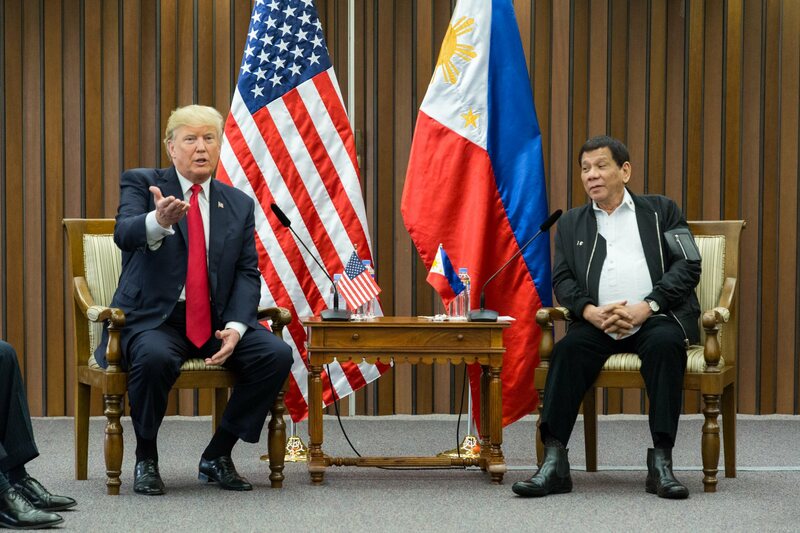 In response, Trude Raizen, a press attache at the US Embassy in Manila, said: “We have a strong and robust security alliance with the Philippines, and the United States by its mutual defence treaty obligations. Despite the long ties between the Philippines and the US, President Duterte has announced a policy of pivoting towards China and Russia. However, despite this, opinion polls consistently show the majority of Filipino people favour Washington. Lorenzana’s words are also at odds with a statement he made earlier this month, when he described the alliance with the US as “the biggest strength of the Philippines”. It’s embarrassing that people take this habitual liar seriously. Obviously China would, and China is taking over the country. They have stolen our islands and our seas and our natural resources. They have bullied our fishermen. They have even built military bases in our waters on fake islands that were created by destroying our reefs! They have landed their military planes in our airports. They have sent waves of immigrants here to compete for our jobs. To weaken us, they have sent almost all of the illegal drugs and illegal paraphernalia and drug-making equipment here, plus fake rice and other dangerous products. And China has buried us in debt. ^ After all of this, why did Duterte say in April, “I simply love Xi Jinping”? Because Duterte was bought by Xi’s money.